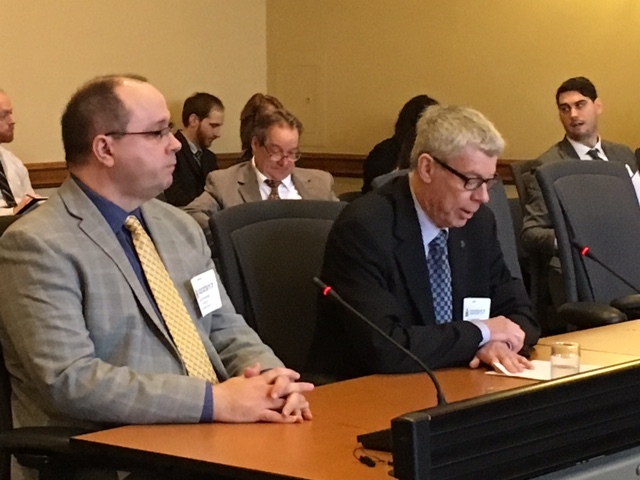 OSSGA Executive Director, Norman Cheesman, and Dave Hanratty, Director of Land & Resources with CBM Aggregates presented OSSGA’s recommended revisions to Bill 39 to the Justice Committee at Queen’s Park on February 23rd. Section 62.4 would give the Minister new authority to direct existing licences to conduct and submit new studies. OSSGA argued that safeguards protecting the environment and other concerns are already in place and that this new authority would have the result of putting existing assets in danger of being sterilized, ultimately undermining a producer’s ability to properly value its assets. That Section 71 be amended to not include recycled aggregate in the tonnage limits – and that the wording be clear that it is material extracted from the site vs. removed from the site that is counted in the limit. Section 3.1 which speaks to Aboriginal consultation be amended to remove the word ‘adequate’ in relation to the required consultation. This amendment was recommended as it felt that the term ‘adequate consultation’ would enshrine something in legislation that is not well defined. OSSGA also provided the Committee and Ministry staff with line-by-line recommendations on changes to the legislation. A copy of OSSGA’s submission and the detailed recommendations are available by clicking read more below. A second day of hearings is scheduled for today (March 2nd), after which we expect the Bill to move to 3rd reading in the Legislature fairly quickly.